Summer blockbuster season is almost upon us, and there are some great movies on the docket. There are some.... not so great movies as well, and we need to talk about those. A common refrain these days is "No more remakes! No more sequels!" But no one is complaining about Spider-Man: Homecoming, are they? It looks like a good movie. At the same time, no one asked for another Transformers movie, yet there it is, in all it's explodey glory, trotting out the same crap Michael Bay has since Bruckheimer let him off the leash. If you've read any of my missives on this site before, you know that I find mediocrity more a crime than simply being bad. There are a lot of bad movies out there that tried. Ed Wood may have made terrible movies - and terrible they are - but he tried. It drives me bonkers that Michael Bay gets handed hundreds of millions of dollars to roll out (that was unintentional) Megan Fox lookalikes while junkyards mash into each other. Which leads me to question my own hypothesis here- what is it that separates a bad movie, from a good one, from a mediocre one? The first thing that a movie should do is tell a story. That may seem an obvious statement, but if it is, a lot of people missed the obvious. What story, exactly, do any of the Transformers movies tell? Or any of the DC movies? Suicide Squad felt like six different movies spliced together into something entirely unintelligible. Compare that to, say, Arrival, which told a brilliant story that was, for being complex, easily understood and explained. There are a lot of aspects to making a good movie, but if it has no story, or the structure is terrible, none of them matter. All the flashy effects and A-list actors mean nothing without a skeleton for the meat to hang on. Which ties nicely into another essential element- originality. We live in the age of reboots and sequels. For that matter, though, nearly everything is an adaptation. Sure, every bestseller with the word "Girl" in the title gets a blockbuster adaption, but Arrival was a story first, and so is nearly every movie. That's no crime, though- as long as something original is brought to the story. Take comics, for example. Watchmen was basically a shot-for-shot adaption of the comic, with a tweak to the end, yet it managed to have exactly zero substance. The current run of Star Trek films (of which I am a huge fan /s) are rehashings of old Star Trek with glitzy effects. There are boundless options for these adaptions- especially in the era of 90's nostalgia and comic book movies. The ones that work, though, are the ones which use the format of a movie to bring a new dimension to those stories- Spider-Man: Homecoming, Logan, and The Dark Knight leap to mind. All draw heavily on the source material, but are not limited by it, or by simply trying to copy it. That originality and creativity is what sets them apart from the dour affairs which are, say, Batman v Superman, which has rich source material that it recycles into incomprehensible garbage. "But DESR, I just want to go shut my brain off for two hours," I hear some people saying. "It's just a dumb popcorn movie." Fair enough- it is entertainment, after all. But this is like skipping a steak dinner for McDonalds. It's pretty pointless and unhealthy. Jaws is responsible (largely) for the summer blockbuster, but it is still a damn good movie. What makes it a great movie? It is creative, it has stakes, and it has a ton of depth to it. It's a better way to spend a few hours being entertained than any of the interchangeable, forgettable affairs the come out every summer. Because, let us be honest, it's about money. You and I only have so many dollars to spend going to movies, and movie studios have many many many dollars, but still only so many, to invest into making them. Where we spend *our* money, however, actually counts for more than where they spend theirs. The best example of this is this years Oscar drama, of La La Land and Moonlight. Now, La La Land was a serviceable film, but aside from being well-acted and directed, it was completely uninspiring. Sure, it had some emotional moments, but none of them were original. It fell victim to [DIGRESSION ALERT] one of my biggest directing pet peeves, and that is "paying homage" to another movie or director. Except it's not that, it's literally lifting the shot/plot point/camera move, and putting it in your movie and then the audience is all "OMG he did the same thing Spielberg did!" It's not clever, it's cheap, and it needs to stop. It's also 98% of La La Land. [END OF DIGRESSION ALERT]. By contrast, did you SEE Moonlight? Go watch it. I'll wait. Back? Yeah, that's how you make a movie. Only one of those movies is truly original, emotional, inspiring AND entertaining, and it's not the one where the white dude saves jazz. But what drove it was money- $1.5m budget for Moonlight, with very little marketing. Word of mouth did most of the work. La La Land, on the other hand, $30m for La La Land, and it was marketed and shown everywhere. It made tons of money, as one would expect- and that's the difference. 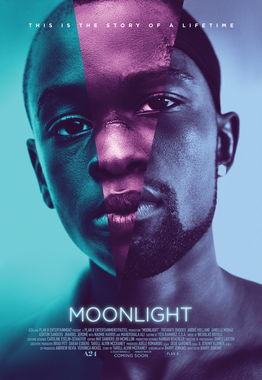 Moonlight wasn't expected to make the money it did- but the fact that it did, that people went to see it, that word spread like wildfire around it, lead to its well-deserved best picture award. More than that, it will hopefully lead to more movies like it being recognized and being put forward in place of the cookie-cutter blockbusters to which we have become accustomed. It won't just happen with one movie though- So, please, I beg of you, when you consider how to spend your movie-going money and time, spent it on something worthwhile, something meaningful, and something original.